Potatoes, cooked in butter until golden brown. See notes below for Rosemary Potatoes. Set heavy saucepan on medium heat. Add butter and potatoes. Cook on medium heat until butter and potatoes are golden brown. 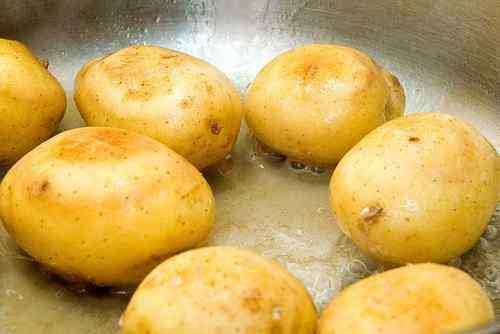 Add water, cover, reduce heat and cook until potatoes are almost done (depending on the size of the potatoes, ca. 20min). Check done-ness with fork. Add water if evaporated before the potatoes are done. Remove cover, cook on medium heat until water has evaporated. To make rosemary potatoes, add 1/2 tsp of rosemary to the butter and potatoes.